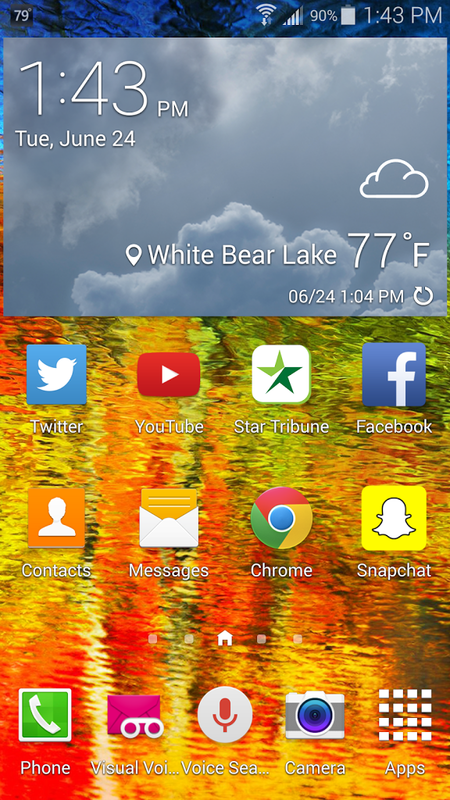 You are at:Home»Uncategorized»What is your ideal homescreen layout? Now the homescreen is something we see everyday on our phones, some times constantly. It is the gateway to our social media, contacts, messages, emails, and even our jobs some times. I am obsessed with making everything on my phone symmetrical and clean. I hate having app shortcuts in odd spots. I make sure that my main apps are on the front page and this layout has been constant with all my phones (even the short period of time where I had an iPhone). As far as widgets go, I always have a clock displaying the weather, usually a stock one on the device. My personal favorite will always be the HTC Sense flip clock. I am sure some of you will attest to that. Other than that, the entire homescreen is filled. There isn’t one square of wasted space. Below you can see my homescreen on my Galaxy S5. So what I want to know is, if I am the only one who lays their phone out like this. All of my friends have gaping wholes all over their homescreen with no use of widgets (and it looks horrible!). Leave a comment below of how you layout your homescreen or even put a screenshot in the comment section. Below you can see my personal screen.